On duty: Chef Hemant Oberoi (second from right) at work. If the intention of Discovery Travel & Living’s new reality series Hotel by the Bay is to showcase the Taj Mahal Palace & Tower as a five-star behemoth with impeccable service, then the producers can rest easy. In essence the show, touted to “uncover the real story of the unseen ‘Storm Behind The Calm’", comes off as an earnest PR exercise that confirms the Taj’s five-star status. Every scene is an opportunity to subliminally transplant the hotel’s turreted facade on to our brains, before pouncing in to trumpet the astounding professionalism of its staff . A five-star hotel with professional staff? How unusual. To be fair, no luxury hotel would have allowed a reality show to screen anything that was less than flattering to its hallowed image, but isn’t the whole point of reality television to shamefully broadcast the pitfalls and misfortunes of its sorry subjects? According to Niret Alva, chairman of Miditech, the production house behind the series—not really. The word reality, he says, is a much abused word. “We were not interested in making an investigational style documentary," he says. “This was meant to be an observational documentary." In which case, this would have been better cast as a fly-on-the-wall documentary of the workings of a five-star rather than a sensationalist series that disappointingly reneges on its promise of any kind of storm. The closest we get to even a mild stirring is when designer David Winters, called in to oversee the renovation of the Ballroom, discovers that the workers have been cutting the new carpet with scissors (apparently there’s a special instrument that prevents fraying). 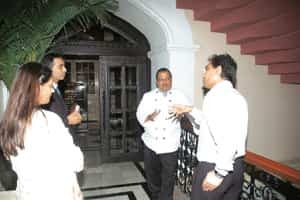 Even executive chef Hemant Oberoi, cast as—yes, you guessed it—“demanding", is woefully polite, sending his trio of minions back to the chopping board with the nicest of reprisals. There are, of course, the “well, who knew" moments where we discover it takes 250 lights to illuminate the sea-facing facade of the hotel, and that room service requests are ideally delivered within a 25-minute deadline, but these do little to mask the overall feeling that viewers are being sold a multi series marketing pitch on why the Taj is the best hotel in Mumbai. The narrator’s theatrical faux-anglicized intonations do little to help—in fact, he sounds suspiciously like the voice-over guy from Star World who confuses his Vs and Ws (the hotel is under “renowation"). Yet, the show does a great service to the hundreds of unnamed faces that form a constant scurrying background to various department talking heads. When chief engineer Ravinder Seth and his team of workers are dispatched to string up the 120ft-high dome with lights, we feel a twinge of sympathy for the lone, sweating engineer making his way up a dangling ladder. And when the in dining manager pockets a pair of tickets gifted by a grateful and well-fed manager of the South African cricket team, we feel slighted for the servers and cooks and cleaners who should have gotten them. In another episode, a beleaguered rookie whines about cleaning duties, sounding wondrously, well, real, and in Alva’s words, “unscripted". It’s the housekeepers, the waiters, the kitchen cleaners, and other back-office employees that are the real stars of this show. Without them, you get the feeling the Taj would collapse, and Dr Kacker would still be ranting about his “fineckty" demands. Hotel by the Bay airs on Discovery Travel & Living every Sunday at 8.30pm.